Home Behind Enemy Lines Prison Stories Angola 3: Time for justice is now! On Tuesday, May 29, Albert Woodfox began a three-day hearing that may result in his conviction being overturned for a third time. Proceedings began at 9 a.m. in Courtroom 1 at the U.S. District Court in Baton Rouge and continue through Thursday, May 31. Albert will be present for the proceedings, and the hearing is open to the public. Unlike the first and second time that Albert’s conviction was overturned based on judges who cited racial discrimination, prosecutorial misconduct, inadequate defense and suppression of exculpatory evidence during his first trials for the 1972 murder of Brent Miller, this proceeding will seek to overturn based on apparent discrimination in the selection of a grand jury foreperson during his 1998 retrial. The well known facts of the Angola 3 case will not be debated; all that will be examined is whether or not people of color were discriminated against during the grand jury selection process. This means instead of murder mystery theatre, witnesses will mostly discuss compositions of the pool of grand jury forepersons in the parish where Albert was indicted. Expert witnesses will discuss statistical analysis and methodology, the demographics of the community and the sociological mechanics of how discrimination can play out in the criminal justice system. If successful, this claim could serve to overturn Albert’s conviction for a third time. Judge James A. Brady, the same judge who overturned Albert’s conviction the second time in 2008, will preside. That ruling was ultimately reinstated on appeal by the U.S. 5th Circuit Court of Appeals who cited AEDPA-gutted habeas protections that limit federal power that allowed them to defer judgment to Louisiana. Although there are no time limits officially imposed by law, Brady is expected to rule before the end of 2012. 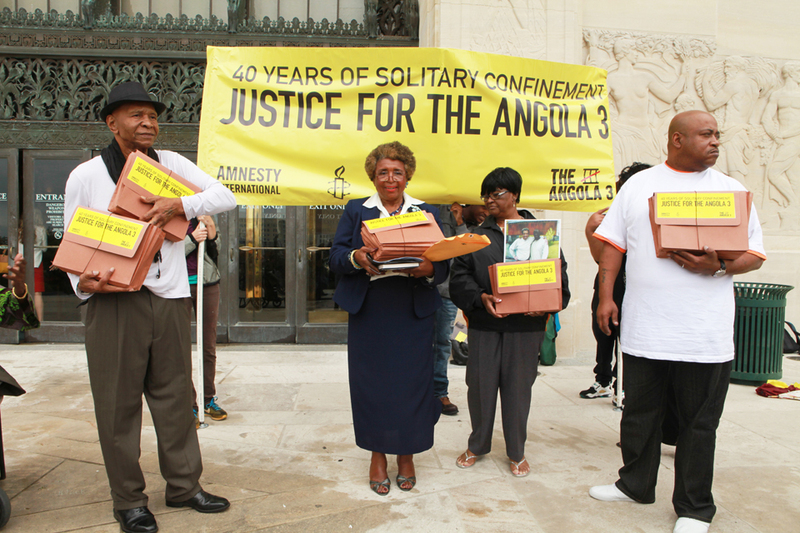 For more on the case, go to http://www.angola3.org/thecase.aspx. View and download a new Angola 3 flyer updated to be used as an organizing resource at http://www.indybay.org/newsitems/2012/05/17/18713711.php. On April 17, Amnesty International was joined by a delegation of supporters, holding a press conference at the Louisiana State Capitol building in Baton Rouge, La., and hand delivering to Gov. Bobby Jindal’s office the petition initiated by Amnesty International demanding the immediate release of Herman Wallace and Albert Woodfox from solitary confinement. Gov. Jindal refused to meet with the delegation despite several attempts made by Amnesty International to contact him in the weeks leading up to the petition delivery. That morning Robert King was interviewed live by Democracy Now! and many others have reported on the 40-year anniversary, including BBC, The Guardian UK, Mother Jones, and KPFA’s Africa Today (http://www.kpfa.org/archive/id/79267 and http://www.kpfa.org/archive/id/80376). Following the event, King writes that “standing on the State Capitol steps on Tuesday, 17 April, I felt the power of the people, of 65,000 people and more – all those who have supported the Angola 3 over the years were also with us. We could not be ignored – the media were there and wanted to report on this; organizations stood by our side in support. Amnesty’s presence was felt. We want to thank everyone who has supported this campaign! Among the powerful lineup of Angola 3 supporters at the petition delivery and press conference were Alfreda Bester-Tillman, Esq., from the Baton Rouge Chapter of the NAACP, Pastor Kathleen Bacon from the Slidell Chapter of the National Action Network, U.S. Representative Cedric Richmond and State Representative Patricia Haynes-Smith, chair of the Louisiana Legislative Black Caucus. View more photos from the State Capitol and read the full statements by Robert King, Herman Wallace and Albert Woodfox at http://neworleans.indymedia.org/news/2012/05/16795.php. Join our new Facebook page for all the latest news. 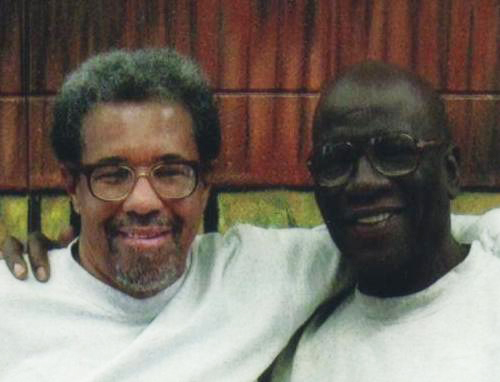 Send our brothers some love and light: Herman Wallace, 76759, Elayn Hunt Correctional Center, CCR-D-11, P.O. Box 174, St. Gabriel, LA 70776; Albert Woodfox, 72148, David Wade Correctional Center, N1A3-670, Bell Hill Rd, Homer, LA 71040; Robert King c/o Kings Freelines, 2008 New York Ave. #B, Austin, TX 78702, kingsfreelines101@gmail.com, (512) 473-0680.